SEO is an ever-changing process and therefore, you need to be up with all the latest updates and best practices to achieve the best results. Now, if you are looking for some good and actionable best SEO tips, then you are in the right place. Search Engine Optimisation is something that every website should do if you want your presence to be seen online. Well, by optimising your website for search engines, you will increase your chances of ranking high for your main keywords, and this could mean that you will get more traffic to your website. Whilst SEO is not a rocket science, and anyone could do it, you need to understand that there is a very small border between white hat and black hat SEO. White hat refers to optimising your site using the practices agreed by Google. While black hat involves shady techniques and strategies that violate the Google Webmaster guidelines. Yes, it is not something that you should do if you really care about your website. 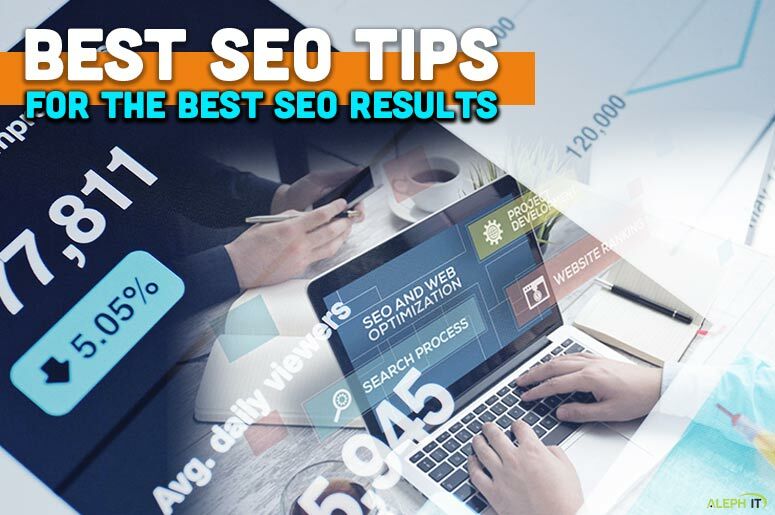 Now, in this article, we will be talking about the best SEO tips and tricks for websites that aim to achieve long-lasting results. So, let’s get started! Always remember that SEO is an ongoing process. Yes, search engines are updating their ranking algorithm. That is why the technique you use now may be obsolete the next time. So, to be successful with it, you have to understand the whole process. Know what works best and avoid using outdated techniques. Well, your content is the most vital part of your website. Without good content, it is impossible to rank high on Google. So, your article must be well-written and provide real value to your readers and target audience. Before starting any article, make sure to do proper research of keywords. Yes, never start writing without doing keyword research properly. You may use Google keywords tool to find what people are searching for and for what problems they are trying to get answers. Moreover, study the trends and understand if the demand is increasing or decreasing. The speed of your website is also a ranking factor. Although it is not crucial, it is still something that you also need to consider if you want to create a good overall user experience. Remember that websites that load in more than 5 seconds can be labelled as slow by Google. Well, your titles should be unique, catchy, and relevant to your article. Add your primary keywords in your title if possible. Ranking high without having the main keywords in your title is a rare scenario. Using a meta description will help you give Google a summary of your content. Likewise, it helps you describe what your article is about and use of your main keywords inside. Thus, make sure ro use unique and relevant meta description for every page on your site. Sitemaps help google easily find your site’s pages and crawl them. Well, there are numerous tools that can help you create a sitemap and even some WordPress plugins. Backlinks are important to SE because without it, your content will be lost somewhere. So, better follow the SEO link building best practices and create links that will help improve your rankings in Google. Moreover, don’t waste your time building bad backlinks from the directory. Instead, try to build quality backlinks from authoritative websites. Keeping tracks of your backlinks is just as important as building them. Well, many SEO companies are building backlinks but they completely forget about checking its status regularly. Another important SEO tip is to be up to date with your keyword rankings. It will help you understand what has worked best and what has given the best results. And by monitoring your ranking, you can also know of your competitors are outranking you. Use social media marketing to reach out to bloggers and build a relationship with them. And once you get to know a blogger well enough, you can ask him to link to your articles. Well, social media outreach is a great way to build backlinks and relationships. Using Google webmaster tools is essential for any website owner. Google tools will give you useful insights and improvement suggestions for the betterment of your website. So, if anything goes bad to your site, this is where you will find out first. Google Analytics is one of the most advanced visitors tracking tool available so you should take full advantage of it. Well, it’s free and can give you a good amount of details about the users visiting your site. Moreover, you may use Google’s click map to determine where users are clicking the most and learn ways to improve your website. Many people think that when SEO is done their website ranking will maintain its position. In fact, this may lead to losses. Aren’t you wondering why competitors are taking advantage and outrank them? Well, here’s the truth! Your website is never done. And you should never stop doing SEO. Yes, there are always new opportunities and best SEO tips and strategies that you can try to make your website rank even better. Using images will help readers understand the content of your website. You may insert screenshots with examples if appropriate. Well, each image should have a relevant name, tags, and description. Images captions are also helpful to describe what your image is about. Doing this will give you the higher chances to rank your page. One of the best SEO tips that SEO expert suggest is to avoid placing links to your website that are penalised or that are unrelated. Well, when you link out to a website, you are vouching that you are trusting and recommending it as a good resource. So, make sure to analyse the website you want to link to. Determine if it is valuable or not. Remember that bad linking can get your site penalised. PageRank is irrelevant, so try to improve your authority by building quality links. Yes, PageRank is useless considering that Google has stopped updating it and announces that it doesn’t have any plans to update. Now, if you haven’t started to create your website, choose a short domain and try to create a brand around it. Well, there is no reason to buy a long domain, just for the sake of having all your keywords inside it. An additional tip, pick for a domain that is easy to remember and pronounce. Sometimes your websites might have links to pages that don’t exist anymore. So, better fix it. With the use of Google webmaster tools, you could identify these types of issues and fix them as early as possible. The thing here is that paid backlinks are terrible for SEO. So, if you want to purchase advertising links or banners, make sure you are using a no-follow attribute to them. Lastly, in today’s trend, people are more often using mobile devices instead of desktop computers. Hence, it would be wise to make your website a mobile-friendly one. In this way, your target audience can reach you with no hassle. Further, with these best SEO tips, you could make sure that it will help bring your SEO strategies to the next level. Likewise, make sure to follow the best practices and always be up to date with the new trends and what is working best for you to make sure a long-lasting result. Aleph IT is the right service provider for you. We aim to provide a high-quality service in order to meet the satisfaction of our customers. Likewise, we offer a variety of services that will help your business grow. For more insights and update, you may visit our blog section. You can also call us and talk with our friendly representatives about your concerns and we will be happy to assist. This entry was posted in SEO and tagged Best SEO Tips, Best SEO Tips and Strategies, seo tips.